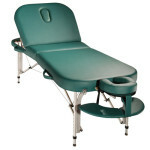 The Earthworks Touch Plus massage table in my opinion is the toughest and strongest massage table on the market. It has so much going for it in every department. Its extra wide, has super strong aluminium legs and a thick frame and foam padding. If massage tables were cars, this would be the 4×4! I don’t own one myself as I don’t require a lifting back rest but I teach a night class once a week at a local college and they have 8 of these in their training room so I have gotten to know them quite well. I also know a lot of pregnancy massage therapists buy this particular massage table because they only feel comfortable treating pregnant clients on a wide and strong massage table. The design of the table top is the same as the Earthworks Comfort model which I also recently reviewed. It has a rounded shape almost like an egg timer. The top and the bottom of the table are an extra wide 30 inches. Sometimes wider massage tables can be difficult for smaller therapists to lean over so what Earthworks have done to solve this problem is slightly taper the table so that it is 3-4 inches slighter in the middle of the table. The narrow section is where the clients waist is so it doesn’t affect them. I know acupuncturists also like to choose this model because they require their patients to be laying in one position for a long time and their arms are usually down by their sides. The extra few inches this table provides gives the patients the extra arm space and security to be comfortable for the treatment. Great massage table, love the way the head cradle stays in the back rest when it is in it’s up position. Thanks for reviewing Stephen.